Verizon – Are You Listening? I’m not letting up on this issue. For me examples like this are the very reason this blog exists. Here’s someone, clearly having trouble with Verizon. There’s no judgement here as to whether their complaints are justified or not. But that doesn’t matter. @KatStep2010 clearly does have issues. So, as she says, are Verizon listening? If so, will they engage? I’m going to be following this closely and will report back if anything happens in public. Since starting this, here’s an update already! I can’t get thru to anyone they keep sending me bills for an account I canceled in June. @Verizon is there anybody out there? @Verizon Why have I been on hold for 45 minutes? and why oh why won’t you help me? So it seems Verizon aren’t listening. @katstep2010 Pls fill this out so I can securely get your acct info http://bit.ly/bKAG12 + advise. 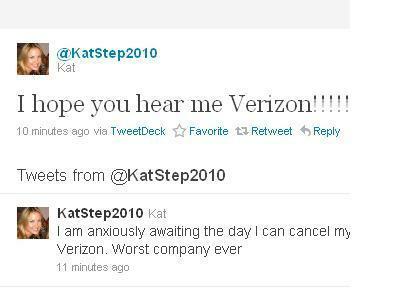 @katstep2010 Hi it’s my understanding you have an old FiOS acct that should’ve been cancelled, we can help with this. Told you I’d report back!